As someone who loves to pin, it never occurred to me that there could be cons to collaboration boards. Recently, some of the mom bloggers here in Las Vegas where talking about this at New Media Expo and why they don't accept invitations. They had valid points, but I think the benefits out way their arguments. 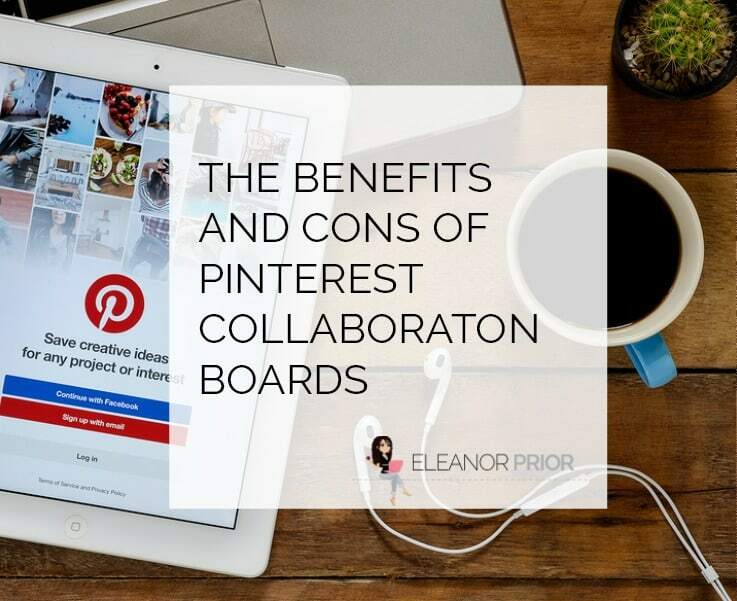 So I decided to write this post on “The Benefits and Cons of Pinterest Collaboration Boards”. First I thought it would be fun to show you how to create a collaborative board on Pinterest. If you love to pin, you might want to consider inviting someone to pin with you. Whether you are planning a trip with your family or throwing a dinner party for your friends, group boards provide an easy way to use Pinterest as a collaborative tool. Just follow the simple steps in the video to get started. The down and dirty of what collaborative boards on Pinterest are, is a group of people who can add pins to one board instead of just one person. I love this, because it is good for control freaks who don't like to step out of their comfort zones. It helps you build relationships with those you invite to collaborate with you. Getting ahead of myself here, but If I have a relationship with you and I see one of your pins. I will repin it just to give you some pin linky love. Or if I need to have something pinned or repinned I can straight up ask for it. The benefits of Pinterest collaboration boards are endless. Benefit = Traffic is the biggest Benefit! However, it has to be a team effort. Benefit = Followers on Pinterest, new people will discover you when they check out the board and you have shared pins or the person who created the board pins or repins you. Benefit = Exposure to other Pinterest users that you may have not met. Benefit = The board can be promoted via social networks just like other boards. Twitter, Facebook, Google+ resulting in new followers, traffic to your blog, and it will grow! Benefit = Meet the other collaborators, and follow them. Build a relationship with them. Benefit = They are fun! It is a party inside of Pinterest. Con = Creator can delete board and has full control over it. However, sshhhh don't tell anyone, because it is a secret.. But you can pin the same pin on other boards… just a thought. Con = Board creator is the Queen, and you and the other pinners are the Princesses. Again, no big. Princess Diana always out shined Queen Elizabeth. She still does even from the grave. Think I am a loon for saying so? Just go do a search for them both in Pinterest. Ya… I'm right aren't I. In order to add a Pinner as a contributor you have to be following at least one board that belongs to them. Then Type his/her username into the text field as I showed you in the video above. Don't forget to save settings on the board when done. If they don't accept it don't resend it. As you see in the picture it is obvious to them and it will notify you when a contributor accepts. This is the Pinterest collaboration board for Mom Bloggers Las Vegas, we would like to invite you to follow it. Just click on the image and follow! Now get to collaborating! This is brilliant…as usual. I love the plan to double pin your pins, again Brilliant. This is a keeper post. Interesting ideas shared here Eleanor. I am not clued up on the Pinterest phenomena, however, I do have an account and have added a few things but not as often as I use other social media sites. Reading the benefits here has given me a few ideas and I might get into this pinning and collaborative board party! Thank you Maeve, I love the possibilities for traffic and building relationships. Thank you Cher, have a great weekend. I haven’t tried a shared board yet, but want to give it a try. Thanks for the tutorial! I’ve just launched a collaborative board with a group of bloggers – the increase in followers has been immediate and impressive. Thanks for listing the cons. I wasn’t aware of these. Thank you for stopping by Sarah, to me the con’s don’t matter much they sure don’t compare to the benefits ;0) Have a great day. Oh what is the link to your group board? Thanks, Eleanor! The comment form wouldn’t let me include the link so I put it in the website field. It’s called Inspiring Christian Women. So is it ever a “con” that you aren’t in control of what gets pinned? That others might not be as good at selecting good content as you? Or is this not a concern? Thanks! I hadn’t really thought of that aspect of it, but I think as the board owner you can delete pins that you don’t like. Not so sure though it is a big concern, but definitely something I had not thought of. This is my first visit to your blog.I am very happy google redirected me to this valuable post.I really like the way you have explained your ideas and expressed it so gracefully.A big thanks to you for sharing such a nice post with us.